Sonic-Six adjustable pole Strat pickup, so you can adjust/stagger the pickup pole heights to match your fingerboard radius & string set for a good, balanced rounded sound. Either staggered or flat pole Stratocaster pickup in the same design. Adjust the height of the individual threaded magnets to suit your fingerboard radius & string set with the Sonic-Six Strat Pickup. Unlike my Strat sized P90 design (Strat-90), the Sonic-Six has six individual threaded magnets to allow you to dial in each string, match your fingerboard radius & string set or simply play with individual heights for tonal variety and versatility. Although they look similar, its a whole different design to my Strat sized P90 pickup. The P90 design has bar magnets underneath the coil with ferrous steel screws threaded through giving a grittier tone. The individual threaded magnets here are akin to the individual rod magnets of a standard Strat, giving that clear, glassy Strat sound. Available in either my Skinny 'Scooped Mids' wound with thicker 41AWG coil wire, Low or Medium wound with my 42AWG coil wire or Overwound/Hotter versions wound with my thinner 43AWG wire, I can also make custom versions to suit your own specifications. The Low output is similar to my Classic '69 Strat Pickups, the Medium output is similar to my Extra Width Strat Pickups and the Hotter version is similar to my Alt '88 pickup - the only difference being that the threaded magnets are more like Alnico 5 with good strength, giving great clarity & definition. A simple flat headed screwdriver is all that you need, simply adjust the magnet height to suit. Closer to the strings gives you more 'boom' but may encounter string interference whereas further away will give you more warmth & resonance but at the expense of clarity & definition. I also recommend starting off almost a couple of mm away from the underside of the string and then further adjust until you find the sweetspot. Play around with following the radius of your neck/nut/string span. Available in all the usual Strat cover options. The Middle Pickup can be RW/RP for hum cancelling in positions 2 & 4. 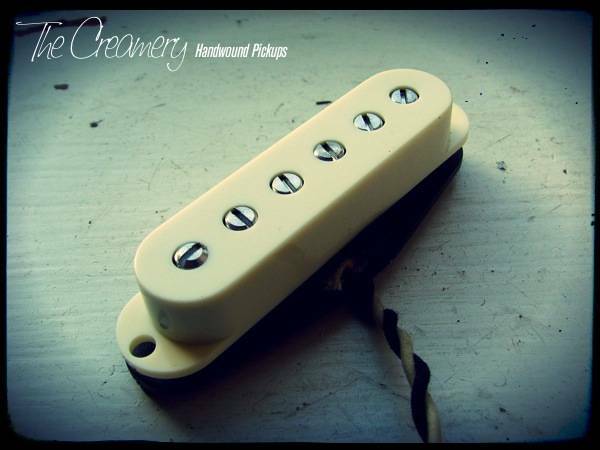 You can find more details of my Creamery Custom Handwound Replacement Strat Pickups here. Each pickup is custom made by hand and I simply work through orders one-by-one. I had to increase the lead time simply due to demand but let me know if you need them sooner for recording or gigs / live dates. Paypal Verified - You don't need to have a Paypal account to pay securely using your regular credit or debit card. Stratocaster®, Telecaster®, Jazzmaster®, Jaguar®, Esquire®, Mustang®, Duo-Sonic®, Precision® Bass and Jazz® Bass are registered trademarks of Fender Musical Instruments. ES-175®, Flying V®, Les Paul®, S.G.®, L-5®, Byrdland®, Gibson®, Casino® and Epiphone® are registered trademarks of Gibson Guitar Corp. Gretsch® and Filtertron® are registered trademarks of Fred Gretsch Enterprises. RIC™, Rickenbacker® , and Toaster® are trademarks of Rickenbacker Int’l Corp. The Creamery has no affiliation with these companies and names are used only for descriptive purposes. © 2017 The Creamery, Handwound Pickups - "Dance, Dance, Dance to the Radio"